1Department of Agronomy, Faculty of Agronomy, Universidad Nacional de Colombia. Bogota (Colombia). Received for publication: 22 July, 2009. Accepted for publication: 2 November, 2011. This research was conducted in the district of El Rosal (Cundinamarca) in a Typic Hapludand soil and sought to evaluate the effect of foliar and soil applications of different doses of manganese (Mn) (0, 1, 2 and 3 kg ha-1) on the potential yield of the Criolla Colombia cultivar. Sulphate Mn granules (Microman ®) and chelated Mn (MF-Mn®) were used as sources. We used a split-plot, randomized complete block design with four replications per treatment. 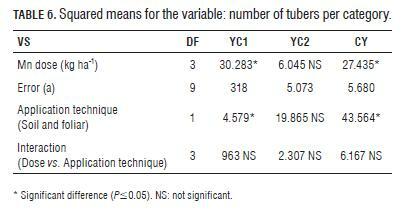 The variables studied were: weight and number of tubers per category. The results show that the application of both soil and foliar Mn exerts a positive response in the criolla potato, with increases of 52% in commercial yield and more than 100% in first category yield with respect to traditional fertilization. The optimal dose is between 1.5 to 2.0 kg ha-1 for both soil and foliar Mn, with an economic optimum between 0.8 to 1 kg ha-1 Mn, edaphically applied. The results showed no differences between the techniques of foliar and soil application for yield potential, but did for number of tubers. Key words: diploid potato, foliar and soil fertilization, yield, tubers. Esta investigación se realizó en el municipio de El Rosal (Cundinamarca), en un suelo Typic Hapludand y tuvo como objetivo evaluar el efecto de la aplicación edáfica y foliar de diferentes dosis de Manganeso (Mn) (0, 1, 2 y 3 kg ha-1) sobre el potencial de rendimiento del cultivar Criolla Colombia. Como fuente se aplicó Sulfato de Mn granulado (Microman®) y Quelato Mn (MF-Mn®). Se utilizó el diseño de parcelas divididas con bloques completos al azar y cuatro repeticiones por tratamiento. Las variables evaluadas fueron: peso y número de tubérculos por categorías. Los resultados muestran que la aplicación de Mn tanto edáfico como foliar ejerce una respuesta positiva en el cultivo de papa criolla, con incrementos de un 52% en el rendimiento comercial y más del 100% en el rendimiento de categoría primera con respecto a la fertilización tradicional. La dosis optima está entre 1.5 a 2.0 kg ha-1 de Mn tanto edáfico como foliar, con un óptimo económico entre 0.8 a 1.0 kg ha-1 de Mn aplicado edáficamente. Los resultados no demostraron diferencias entre las técnicas de aplicación edáfica y foliar para el potencial de rendimiento, pero si para el número de tubérculos. Palabras clave: papa diploide, fertilización edáfica y foliar, rendimiento, tubérculos. In Colombia, the name of the "criolla" potato corresponds to the morphotypes of the tubers, a yellow skin and flesh color (egg yolk phenotype) (Rodríguez et al., 2009). It has been classified as Solanum phureja (Hawkes, 1990), Solanum tuberosum Group Phureja (Huamán and Spooner, 2002), and most recently as Solanum tuberosum Group Andigenum (Spooner et al., 2007; Rodríguez et al., 2010). According to MADR (2006) the criolla potato has recently acquired large interest in its export potential, being one of the potentially promising exportable products in Colombia, which affirms the need to improve research and transfer of culture technology and adopt good agricultural practices with emphasis on the proper use of water and management of soil fertility. The rising price of agricultural inputs and agronomic crop mismanagement create low productivity and threatens the competitiveness of the production system (Martínez et al., 2006), and so it is important to identify limiting yield factors and develop innovative practices for managing crop fertility, such as integrated and balanced nutritional management, which is one of the most efficient practices to ensure the plant the opportunity to express its genetic potential that will eventually be reflected in better quality and yield (Gómez, 2005). Mn as an essential nutrient: soil and plant factors In the context of nutritional balance, micronutrients have become important due to their physiological effects on the expression of structure, photosynthetic activity and crop quality; for Mn, management should relate the soil with the availability of this mineral element (Gómez et al., 2006). Factors affecting the availability of Mn to plants are presented in Tab.1. Mn is essential as a constituent metal, active in 35 enzymes, including phosphotransferase, oxidase, decarboxylase, dehydrogenase, arginase, phosphomutase, peroxidase and kinase, involved in the synthesis of chlorophyll, active in enzymes of the Krebs cycle, metabolism of N2 (nitrate reduction) and glycolysis (Taiz and Zeiger, 2006; Marschner, 2006 ; Fageria et al., 2007). It is involved in the photolysis of water, electron transport in photosynthesis and is a structural component in chloroplast, in addition, along with micronutrients such as Cu, Zn and B; it is involved in reproductive growth through hormone balance, in the oxidation of auxin and biosynthesis of secondary metabolites; its deficiency retards the development of anthers and affects the rate of seed germination (Kirkby and Römheld, 2007). When the photolysis reaction is interrupted, it affects electron transport, photophosphorylation and reduction of NO2, CO2 and SO4, resulting in decreased photosynthesis and disruption of the thylakoid membrane system (containing enzymes that control photosynthesis) (Salisbury and Ross, 2000; Clavijo, 2001; Marschner, 2006; Kirkby and Römheld, 2007). Mn is part of an enzyme of superoxide dismutase (SOD) to counteract effects of oxidative degradation of the tissue located in chloroplasts and mitochondria and is important in the protection of biomembranes and the photosynthetic apparatus (Marschner, 2006; Kirkby and Römheld, 2007). Mn acts as an important co-factor for several enzymes essential in the biosynthesis of secondary metabolites associated with the plant via shikimic acid, including phenolic aromatic amino acids, coumarins, lignans and flavonoids. We found lower concentrations of phenolic compounds, lignin and flavonoids in Mn-deficient tissues, which may be partly the cause of lower resistance against biotic and abiotic (Kirkby and Römheld, 2007; Marschner, 2006). A slight Mn deficiency affects photosynthesis and reduces the level of soluble carbohydrates in the plant, but the supply of this reactive contributes to the photosynthetic evolution of oxygen; a severe deficiency disrupts the structure of chloroplasts and this condition is irreversible (Kirkby and Römheld, 2007). By contrast, a high concentration of Mn may be accumulated in vacuoles or other cellular compartments such as the Golgi, and/or decrease net photosynthesis by inhibiting the reaction of the RuBP carboxylase (Marschner, 2006). The pH and redox conditions of the soil are predisposing factors for Mn deficiency in extremely acidic soils; deficiency manifests itself when Fe dominates, even under anaerobic conditions especially in acidic soils, and can reach toxic levels (Bennett, 1996; Prasad and Power, 1997). According to Clark and Baligar (2000), Mn availability to plants decreases in soils with neutral or alkaline pH. Since fertilization is not a practice that can be considered independently, it is important to understand the interactions between factors and elements, which can induce synergistic or antagonistic relationships, nitrogen sources such as the acid reaction SAM favors the assimilation of Mn, as well as maintain an adequate soil Mn-Fe ratio (León, 2001; Sabino et al., 2007). 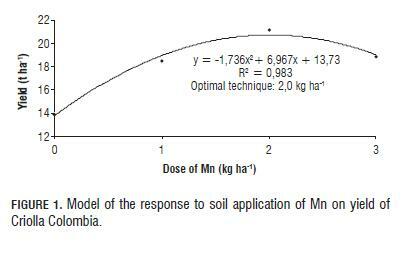 Gómez (2005) referenced the critical level of manganese soil at 20 mg L-1 (Olsen), but more important is the relative ion in the soil, Fe/Mn> 15 mg kg-1, which can cause a deficiency of Mn, or a ratio <10 mg kg-1 induces Fe deficiency as has been observed in rice and potatoes; as this interaction can interfere with absorption as well as metabolic sites, inactivating said processes by reducing the concentration of Fe in the plant (Shuman, 2000; Fageria et al., 2007). Soil salinity causes Mn deficiency (depending on the radical and common transpiration pressure) and decreases the rate of photosynthesis and growth, on the other hand, an increase in atmospheric CO2 concentration increased the foliar uptake of Mn (Shuman, 2000). In acidic soils, Mn is involved with the retention of phosphates, so that excessive application of P compounds Mn deficiency. The application o f acidic fertilizer or products containing ammonium (NH4+) decreases soil pH and increases the availability of Mn, for example Ammonium sulfate [(NH4)2 SO4] probably produces less Mn deficiency than fertilizers with nitrate ( NO3-) (Prasad and Power, 1997; Clark and Baligar, 2000; Espinosa, 2001). The application of potassium chloride (KCl) increases the availability of Mn-reducing the effect of chloride ion (Prasad and Power, 1997; Clark and Baligar, 2000; Espinosa, 2001). Mn is the third most important micronutrient used in plant tissue in most species after Fe and Cl, the proper content in plants is 50 mg kg-1, with a critical level of: <25 mg kg-1; sufficient at 25 - 300 mg kg-1 and toxic at > 300 mg kg-1 (Shuman, 2000; Ulrich, 1996; Bennett, 1996; Salisbury and Ross, 2000). The passive transport of Mn2+ in leaves is much faster than other micronutrients (eg Zn+2 and Cu2+), entry into the cytoplasm and vacuole is an active process similar to what occurs in absorption by the roots, the overall absorption is ion exchange between H+ and a cation and OH- for a anion (Malavolta, 2001). Temperature affects foliar uptake of Mn, decreasing the amount absorbed by 60% more at 10°C compared to 30°C, in addition, the absorption rate (time at which 50% of Mn is absorbed) is between 24 and 48 h, which is mainly transported over long distances as chelate due to the transpiration stream (Malavolta, 2001). The foliar nutrient supply is useful in situations such as low nutrient availability in soil (3-5 mg kg-1), very dry soil, decreased root activity during the reproductive stage (competition for carbohydrates, foliar application can compensate decreased root activity), which is recommended for foliar sprays such as Mn sulfate or chelate type EDTA or DTPA at a concentration of 0.3- 0.6% (Malavolta, 2001; Arjona, 2003). The cationic divalent form (Mn2+) is mobile in acidic soils with organic matter and dynamics of oxide reduction, and is readily translocated through the xylem from roots to buds and shoots of the plant, but transportation is limited in phloem (Prasad and Power, 1997; Marschner, 2006; Kirkby and Römheld, 2007; Fageria et al., 2007), however, other authors like Salisbury and Ross (2000) and Malavolta (2001) reported that depending on the species the element has an intermediate mobility in the plant and its immobility in the phloem causes deficiency as shown in the young parts of the plant (Marschner, 2006). Under conditions of Mn retention in the soil, the roots may exude organic substances which are able to reduce Mn and improve the availability of the micronutrient to the plant (Clark and Baligar, 2000). Mn deficiency can cause the roots to become dark in color, the main root's longitudinal growth stops and lateral roots are usually not formed, however, excess Mn stops the growth of the main root and increases the number and density of lateral roots (Clark and Baligar, 2000). Gómez et al. (2006) indicate that the response to the application of Mn depends on the efficiency of absorption of the crop, nutrient content and native soil characteristics, eg, in soil with a low level of this element and slightly acid to neutral can increase potato yield 10% compared to conventional fertilization, however, in an acidic soil reaction, high in organic matter and Fe can increase potato yield by 17% by applying low doses of Mn (2 to 3 kg ha-1), due to improved nutritional balance especially the Fe/Mn ratio. The recommended Mn fertilization for the potato in the highland conditions of Cundiboyacense can vary from 3 to 6 kg ha-1 (Gómez, 2005; Gómez et al., 2006), while in the criolla potato (Criolla Colombia) application of Mn was associated with an increase in dry matter (DM) (Pérez et al., 2008). Mn fertilization can be applied to the soil or foliarly; the application of Mn as Mn sulfate (MnSO4 · 4H<sub>2</sub>O) in the soil can be between 5 and 25 kg ha-1, while the foliar applied solution is from 0.2 to 0.5%, with a higher rate of translocation as chelated Mn as MnEDTA than MnSO4 (Kirkby and Römheld, 2007). The aim of this study was to evaluate the effect of foliar and soil applications of Mn on tuber yield potential in Criolla Colombia, under the soil conditions of the Bogota Plateau. The study was conducted in San Gabriel in the municipality of El Rosal-Cundinamarca (2,685 m s.a.l. ), precipitation (825 mm/year), temperature (13°C), relative humidity (81%), in a soil classified as Typic Hapludand, with the presence of amorphous materials with andic and organometallic complexes, strongly acidic soil reaction, low cation exchange capacity, high Ca, ideal for Al, but with Mg imbalances. The native Mn showed medium and low levels (12.7 mg kg-1), the Fe/Mn ratio is greater than 30, which induces Mn deficiencies (Tab.2). We used tuber seeds (2-4 cm) of the Criolla Colombia cultivar, with tubers characterized as round, semi-deep eyes, deep yellow skin and flesh, early maturation (120 d), specific gravity of 1.088, no rest period and an average yield of 13-15 t ha-1 (Rodríguez et al., 2009). The application of Mn was performed as a complement to conventional fertilization plans according to soil analysis and comprehensive diagnosis of fertility (88.39 kg ha-1 N, 232.09 kg ha-1 P2O5, 113.29 kg ha-1 K2O, 56 kg ha-1 CaO, 70.75 kg ha-1 of MgO and 6.6 kg ha-1 S), the Mn sources used were: Microman® (Mn sulfate granules at 20%) and MF-Mn® (Chelate EDTA-Mn, 12% soluble powder). The granulate MnSO4 was applied in conjunction with other fertilizers at planting time, equivalent to total doses of 0, 1, 2 and 3 kg ha-1 of Mn, likewise, foliar application was done with fractionated chelate Mn in 5 foliar applications starting at 30 dap and on days 37, 44, 51 and 58 dap. Foliar applications were made with a backpack sprayer (Royal Condor® 20 L), which contained 300 L ha-1 of water treated with the addition of 0.25 g L-1 of Acidurez® MF-SP (corrector reducing hardness and pH) and 0.75 mL L-1 of Herbox-SL (adjuvant-hypotensive). We used a randomized complete block design with split plots and four replications, considering factor A as the application rate (0, 1, 2, 3 kg ha-1 Mn) and factor B as the application technique (soil and foliar). The experimental unit consisted of 21.6 m with 0.9 m between rows and 0.3 m between plants. We determined the number and weight of tubers per category, for the variables: first yield category (YC1) (diameter> 4 cm), second yield category (YC2) (2-4 cm) and commercial yield (CY) (category 1 and 2). The harvest took place at 105 dap. Statistical analysis was performed with analysis of variance (Anova), comparing two factors: dose of Mn (0, 1, 2, 3 kg ha-1) and application technique (foliar and soil) and their interactions; for comparison of means, the Duncan test was used along with statistical polynomial regression analysis to establish the optimal dose. The YC1 significant differences were found between doses of Mn ha for CY. However, there were no statistical differences for the application technique or for interactions between the evaluated factors (Tab.3). This shows a positive response to Mn regardless of application technique, with high efficiency in foliar and soil absorption. The positive response in YC1 is possibly due to increased synthesis of chlorophyll, N2 metabolism, photophosphorylation and electron transport in photosynthesis; confirming the observations of (Marschner, 2006; Fageria et al., 2007; Kirkby and Römheld, 2007), which favored higher tuber quality. Similar results were obtained in Criolla Colombia where the application of Mn increased the DM content, possibly due to increased net photosynthesis (Pérez et al., 2008). A similar response was reported by Gómez et al. (2006) in Potato Parda Pastusa and Diacol Capiro cultivars, as well as in onion (Allium cepa) (Gómez et al., 2007). In the mean comparison test (Duncan P=0.05) for doses of Mn, there were differences between the control and treatments, with greater increases in YC1 at a dose of 2 kg ha-1 Mn and significant decreases above this; applying 3 kg ha-1 decreased production to below that obtained in 1 kg ha-1 of Mn, possibly due to a negative response or phytotoxicity, interfering with the normal function of enzymes, reducing respiration and photosynthesis and producing disorganization of the thylakoid membranes, consistent with that described by Marschner (2006). Additionally, in potato, the application of high concentrations may reduce net photosynthesis, corroborating results reported by Shuman (2000). Similarly, Casierra-Posada and Poveda (2005) found that in strawberry, high concentrations of Mn reduce the diameter, chlorophyll and carotenes of the leaves; affecting leaf area, dry matter production and fruit quality. In YC2, there were no significant differences for the evaluated factors or their interaction (Tab.3), possibly because the highest yield potential is expressed in YC1. The CY Significant differences were found between doses of Mn ha for CY (Tab.3), but not for the application technique, but the foliar application showed higher yield than the soil application. There was no evidence of an interaction between the evaluated factors, which means that for this variable, responses were independent. Like YC1, the largest increase in CY was seen with the dose of 2 kg ha-1 Mn, although there was no statistical difference with respect to 1 kg ha-1 of Mn, in addition, treatments 1, 2 and 3 kg ha-1 of Mn were not significantly different, ie for doses above 1 kg ha-1, yield increase was not significant. This positive response is possibly due to the high Fe-Mn ratio in the soil, limiting the availability of Mn for plant nutrition because of antagonism with the corroborating Fe as observed by Shuman (2000), Gómez et al. (2006) and Fageria et al. (2007). Thus, the application of Mn in doses of 1 kg ha-1 increases the content of the micronutrient in the ground and improves the Fe-Mn ratio, finally generating greater availability of the improved conversion of Mn and the like. Additionally, the percentage of change in yield in the categories (Tab.4), indicates that the application of Mn exerts a positive response in yield and quality, 52% in CY and over 100% in YC1; similar results were reported by Gómez et al. (2006) in Solanum tuberosum, where the application of Mn increased yield between 10 and 17% over conventional fertilization (macronutrients) in two soils of the Cundiboyacense highlands. Th e percentage of change in the number of tubers per categories (Tab.5) indicates that application of Mn exerts positive feedback on the yield of Criolla Colombia, increasing by 13% in CY by applying Mn, soil and 29% foliar; and an increase of 82% in YC1 with soil application and more than 100% with foliar application. Optimal technique: To establish the optimal dose technique, polynomial type regression was performed (Figs.1 and 2), fi nding incremental responses as the dose of Mn increases, but the increase is marginal at doses higher than 2 kg ha-1 Mn. Th e optimal dose for both soil and foliar applications was seen between 1.5-2.0 kg ha-1 Mn. In turn, Gómez (2005) and Gómez et al. (2006) found that the optimal dose technique of Mn in Solanum tuberosum ranged between 3 and 6 kg ha-1 in Cundiboyacense highland soils. Th is shows that the requirement of Mn in Criolla Colombia (diploid) was approximately half that required in the varieties Diacol Capiro and Parda Pastusa (tetraploid cultivars); these results are similar to those reported by Becerra et al. (2007) for the application of macronutrients (P and K) in the Criolla Guanena cultivar. Additionally, for yield by category, the application of Mn increased the production of YC1 in doses of 1 and 2 kg ha-1 Mn, possibly due to the integrated and balanced nutrition which is refl ected in better yield and increased expression of productive stolons, similar to that described by Gómez (2005). For the variable YC1, there were no signifi cant diff erences between doses of Mn ha-1 or application technique (Tab.6). In addition, there was no interaction between the evaluated factors, which means, that for this variable, responses were independent. 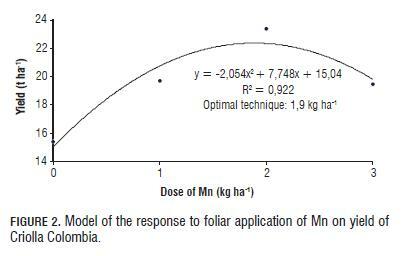 In means comparison test (Duncan P=0.05) for doses of Mn, diff erences were found between the control and the application of 2 kg ha-1, but not between the control and 3 kg ha-1. By applying 3 kg ha-1, production was signifi cantly decreased compared to that obtained with the control, with negative trends related to the marginal dose (Figs. 1 and 2), which could be due to a negative response or phytotoxicity from decreased net photosynthesis, being consistent with that reported by Shuman (2000) and Marschner (2006). By comparing the application technique, foliar Mn was statistically diff erent for the number of tubers in the fi rst category compared to soil application, possibly because the foliar application of Mn acted on young leaves terminals that are usually bronze, making them bright green, which can have a positive eff ect on the translocation of photoassimilates to the tubers, the normal functioning of the photosynthetic process (Kirkby and Römheld, 2007). Th us, to improve the bronze bud, leaves photosynthesized more effi ciently which could translate into an increase in yield potential or possibly in the diff erentiation of stolons. The CY showed significant differences between doses of Mn and the application techniques (Tab.6), but there was no interaction between the evaluated factors. The comparison of means (Duncan P=0.05) for doses of Mn presented differences between the control and the application of 2 kg ha-1 but not with 3 kg ha-1, with the maximum in CY trending toward the dose of 2 kg ha-1, with significant decreases above this, a model that relates to the marginal dose trends observed in the polynomial model (Figs. 1 and 2). Comparing the application techniques, treatments with foliar applications of Mn had higher CY than the ones with soil applications, possibly owing to foliar applications that were frequent and had doses in agreement with nutritional extraction, providing an effective method for providing Mn in a fast and efficient manner. Foliar application may cause more efficient transport, uptake and translocation of micronutrients in the plant than soil application due to reactions occurring in the ground, similar to that reported by Clark and Baligar (2000), Arjona (2003), Malavolta (2005) and Fageria et al. (2007). Soil applications of 2 kg ha-1 of Mn are recommended for the Criolla Colombia cultivar to obtain the best yield potential for the first and commercial categories. This result may be related to the medium to low Mn content found in the native soil and the imbalance of the Fe/Mn ratio, which is why the application of Mn increases the content of Mn, improves the Fe/Mn ratio and makes Mn more available to the crop. The optimal dose technique was found at 2 kg ha-1 Mn, while the most economical dose (optimal economic) for soil application is between 0.8 and 1.0 kg ha-1. The positive response to foliar and soil applications of Mn found in this research represents an alternative that could be widely implemented in farming for producers of Criolla Colombia on the Bogota Plateau to optimize yield potential. However, to improve integrated management of plant nutrition in the criolla potato, the responses to the Mn-Fe, Mn-B, and Mn- Zn interactions in the soil should be evaluated to measure the influence on solids and dry matter, and to measure chlorophyll a, b and carotene content in leaf tissue. The authors express their gratitude to Manuel Caicedo, General Manager of Sociedad Agraria de Transformación (El Rosal), for his collaboration and to Microfertisa SA for the technical and financial support.